Material – Rubber Gym Tiles are constructed of recycled black crumb rubber and virgin colored rubber flecks at a 25% and 75% color density. These recycled rubber tiles are also vulcanized which means they are formed using heat and pressure to form a solid non porous and non absorbent mat surface. This allows for the rubber gym tiles to have the highest tensile, tear, and abrasion resistance on the market for an interlocking rubber tile. This means ultimate durability and longevity. Weight – Each tile weighs approximately 36 Lbs. t is free of all dirt, grease or debris. 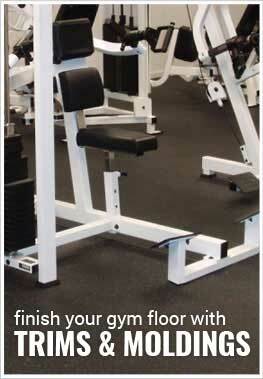 Our Rubber Gym Tile corner and border pieces can be beveled upon request. The flooring is great! Very easy to install. The only complaint is that the tiles are described as being 24" but actually they are only 23" They should have laid out perfectly wall to wall but now there is a 1/2" gap around the room.